When people hear the term “virtual reality,” their first thought might be of a futuristic video game, or a great sci-fi movie involving aliens, outer space, and future worlds. With the entertainment industry being one of the first to adopt immersive technology, many people are just now realizing how effective virtual reality (VR), augmented reality (AR), and mixed reality (MR) — or extended reality (XR) — can be in other industries and use cases. Human resources leaders, for example, are beginning to discover the profound impact VR and AR can have in the workplace. HR departments across industries are under stress and may face conflicting priorities as the rise of artificial intelligence and automation bumps against the need to recruit and retain talent. As a result, HR departments may be facing obstacles, including a widening skills gap, a lack of interest from young professionals, and the shifting desires of the emerging workforce. To address these challenges in 2019, HR teams should consider integrating immersive solutions as a key part of their workforce and people operations strategy. Here are some of the ways immersive technology can help HR teams this year. Immersive technology has the potential to vastly improve how employees learn new skills, and can also be very effective for adjusting behavior. XR provides employees with autonomy, connects distributed workforces, makes training tools easy to share and scale, and offers employers the insight and understanding they need to embrace the changing workforce. An example of an organization embracing XR for these purposes is Farmers Insurance. 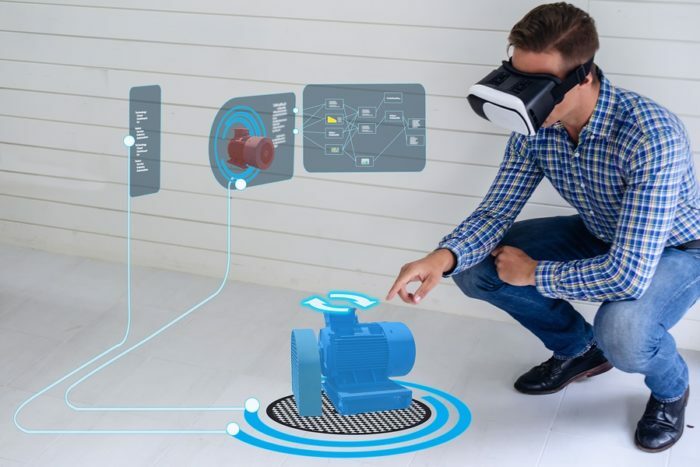 They’ve introduced virtual reality simulation as a means to help revolutionize one of their most complex training procedures: training water damage claims investigators. A multi-faceted task that demands subject matter expertise, investigative skills, and accurate decision making in the field, water damage investigation is challenging to both execute and practice. The Farmers virtual reality training experience allows employees to intimately engage with the subject matter in ways not previously available to them during the learning process. Virtualizing this training experience helps make it engaging, repeatable, and memorable. Because Farmers’ training incorporates movement into decision-making and learning processes, the entire experience can become more active and write to our memories as a real experience would. This has the potential to make the training both more effective and enjoyable for employees. As similar training simulations are adopted for other HR and learning and development user cases, this technology can lead to higher employee engagement, satisfaction, and retention. Additionally, VR training greatly reduces the logistical costs associated with typical learning methods like workshops, seminars, and role play that may require travel and significant time and financial commitments. Being software-based, VR training programs can easily be scaled throughout an organization and shared across teams and departments. This could allow HR teams to avoid the costs of transporting employees to training facilities, hiring coaches and mentors, running workshops, etc. Gen Z and Y employees have different expectations from their baby boomer counterparts when it comes to the workplace. According to LinkedIn’s 2018 Workplace Learning Report, younger workers increasingly seek flexible work environments, place a high value on autonomy, and want employers to invest in their learning and development. Competition for these younger workers is fierce, and many companies are struggling to find ways to recruit and retain them. In order to appeal to this younger workforce in 2019, HR teams should consider implementing agile learning tools and immersive applications to provide Gen Z and Y’ers with the independence, flexibility, and engagement they are looking for. This will be especially important for HR teams at companies that have large, distributed workforces because the technology facilitates global connectivity. Because of these factors, XR helps to achieve workforce flexibility and the connection needed to compete in the new economy. In the coming year, more HR teams could begin offering VR simulations as a way to allow potential recruits to “try before they buy” as a part of job listings. When potential employees are on the fence about accepting a new position, HR teams can give them a realistic and immersive look at what day-to-day life would be like in that position. Not only will this potentially increase interest in the position, but could also help with retention levels down the road because potential employees will have a better sense of what the job entails before accepting the position. In today’s results-driven work paradigm, HR teams often face pressure and expectations of growth, innovation, and financial efficiency. Because XR technology is beneficial for training and recruiting, HR departments can serve as a proof point for adoption of the technology in other business units. Before completely opening up XR adoption to use cases across the business, training provides a controlled test environment for the integration of the technology in other areas. When HR teams lead the way by adopting immersive technology, it inspires the business to adopt a scalable platform strategy for VR, AR and MR. This quickly advances the potential opportunities across the business for XR. Additionally, when companies use immersive technology for training and HR, it also allows the business to focus on documenting the people process. This encourages the business to take a closer look at the future of work, and analyze where it needs its people the most. This year, the most innovative, cutting-edge HR departments should consider adopting XR for their growing teams. The technology has the potential to help these companies realize a great return on investment when used for training and recruiting employees, particularly in terms of financial savings, program efficiency, and employee satisfaction and retention. The successes HR teams have from implementing immersive technology will serve as a catalyst for the adoption of VR, AR and MR in other business units at some of the world’s largest organizations. Kyle Jackson is the founder and CEO of Talespin, an enterprise software solutions company that leverages immersive technology to transform the way global workforces learn, work, and collaborate. A prolific entrepreneur and prominent public speaker, Kyle has founded and led five successful companies spanning enterprise software, media technology, and IT infrastructure, including two successful company exits. In addition to working on 350+ feature films and hundreds of hours of television programming, Kyle has held CEO, CIO, President, and Senior Product Manager roles throughout his career. With extensive leadership experience bridging technology and high-quality content, he has worked with dozens of Fortune 500 partners to deliver media and technology solutions.